This patient presented with concerns about her dominant upper front teeth. 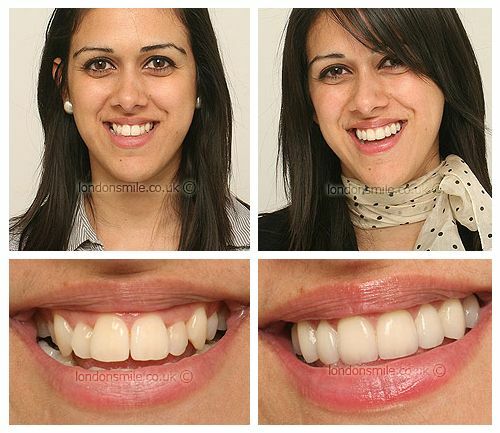 Eight porcelain veneers and a gum lift on four teeth were used to create a more ideal proportion and a wider smile. I’ve been unhappy with my teeth since I was a teenager and have just been waiting until I could afford to have cosmetic dental treatment. Yes, I loved the DVD goggles. Once you had the anaesthetic you couldn’t feel anything and were able to just switch off. Very happy with the result, they look very natural. It means I can smile widely without worrying about how I will look in photos. I loved James – He made me feel very comfortable. He reined me in when I wanted something outrageous, like ultra bright white teeth.